I'm sure I'm not alone when I say this, but whenever it's super cold outside, I immediately want to cook something delicious and warm and comforting. You know, something that will cook all day and make the whole house smell like home. Do you do that too? Especially when we get a lot of snow, you see people posting photos of everything they've cooked while being snowed in. I do it all the time! So, since our recent cold snap of subzero temperatures, I've lately been turning to my slow cooker for a few new all day recipes. As soon as I saw this recipe from The Country Cook, I knew I had a winner. There was just a whole lot of "how can this not be good?" about this recipe! Serve it up with some steamed greens and there's dinner! Prep it the night before to save time! So add this one to your repertoire and keep it in mind the next time there's snow in the forecast. It just may become your new favorite! Heat olive oil in a large skillet over high heat. Season pork chops with salt and pepper. Brown both sides of the pork chops (don’t fully cook the pork chops - just a minute on both sides to get them brown.) Set aside pork chops. In a medium bowl, whisk together the cream of chicken soup with the heavy cream, milk, and minced garlic. Set aside. Slice potatoes and chop onions. Spread the sliced potatoes and the onions into the bottom of a 5 quart or larger oval slow cooker. Season with salt & pepper. Spread half the soup mixture on top of the potatoes. Sprinkle one cup of shredded cheddar cheese on top. Place pork chops in a single layer on top of cheese. Spread the rest of the sauce mixture on top of the pork chops. Cover with remaining cheese. Cover slow cooker and cook on low for 4-6 hours. When done, sprinkle the top with sliced green onion. I think the next time I make this, I may add some fresh thyme leaves to the soup mixture. Just a thought! Not a fan of cheese? Just leave it out! I've never tried it, but it seems to me that the soup/sauce mixture would be just as delicious without it. 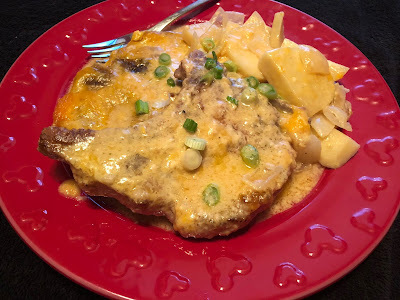 But maybe add a tsp of mustard to the sauce, just to add a little sharp bite that you would normally get from the cheese! When I made it, I had enough ingredients to double everything, so I did! I still did the potatoes and onions on the bottom, and the chops on top. I just piled the chops on top of each other and then poured the soup mixture over all. I also let it cook for a good long time so that the meat was falling off the bone by the time I served it up!